「緑牛」の正体 ? and what about the green bull ? . . must have some deeper meaning. 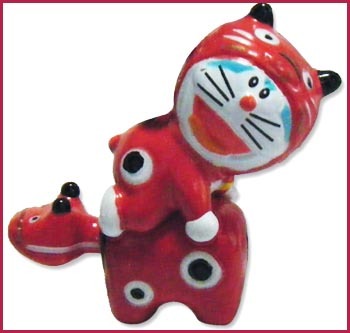 Sometimes the red cow is the "ike no nushi"　池の主の赤牛　master of the pond. Still trying to find that out. Any help is welcome. Some sources say it was the malaria.
. Legends about the Black Cow, Black Bull 黒牛と伝説 kuro-ushi, kuroushi . is a Japanese Wagyū breed of cattle. The beef produced by Akaushi cattle is richly marbled with fat and produces a very tender, flavorful, and expensive variety of steak which is used in Kobe restaurants. originally carrying the title of "Kobe beef" were simply cattle from herds in the Kobe area of Japan, and could be any of four breeds of Wagyu cattle: the Akaushi (Japanese Red), the Kuroushi (Japanese Black), the Japanese Polled and the Japanese Shorthorn. is a Japanese breed of cattle actually created by a government project that included as many as 150 scientists at one point and spanned more than 50 years. The story goes that these cattle were considered the property of the Japanese government and they were never to leave the Japanese islands. the largest purebred group of Wagyū outside Japan is a herd of Akaushi cattle located in Harwood, Texas, owned by HeartBrand Beef. It was raised from a Japanese imported herd of 11 which was guarded by off-duty Texas Rangers to protect from interbreeding for over 12 years until the herd grew to over 5,000 cattle. contains high concentrations of oleic acid, a heart-healthy fatty acid. Akaushi beef has a high ratio of monounsaturated to saturated fats. 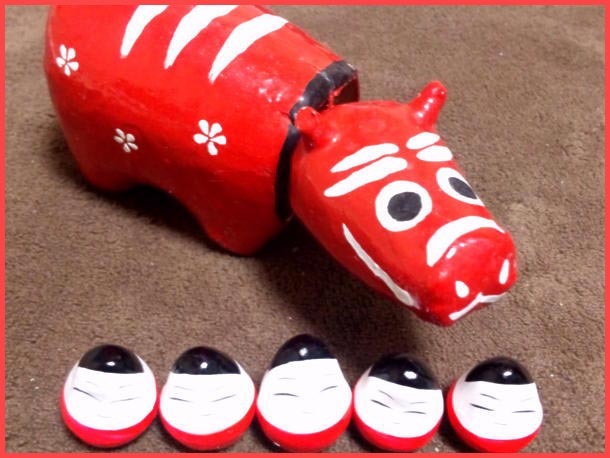 - Now let us go back to the past and enjoy some legends about "red cows".
. ushi 丑 ox, oxen (cow, bull, calf) amulets . 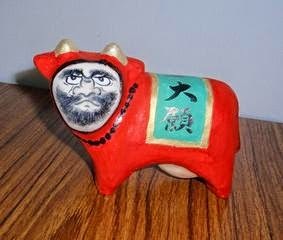 an old woman was on her way back from a pilgrimage to Konpira san and walked through the valley 五重谷, when a red cow came running after her. The old woman became quite scared and thought this must be a monster, so she hid in the forest. The red cow eventually disappeared, but to pray for its soul people built a small statue of Jizo Bosatsu at this spot.
. Konpira Daigongen . 金毘羅大権現 . Way back in the mountanis of the hamlet there is the top of an old five-storied stone pagoda 五輪塔, called ガラン Garan. It is not allowed for women to go there and other villagers may only come during the special ritual days. 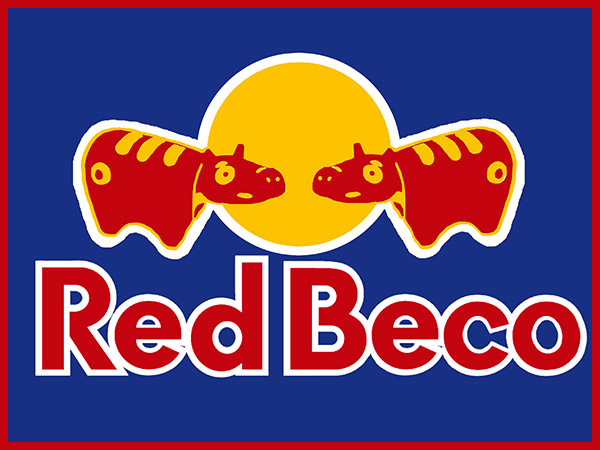 There are 16 powerful deities venerated here and they use the red bull. Recently a five-storied pagoda has been dug out below the Garan, but the man who did it became a terrible headache. So this one too is venerated in the Garan now. When 伊達成実 Date Shigesane (1568 - 1646) built the castle, he had a red bull burried alive in the wall as a protector deity. On a special prayer hill in the South of his living quarters he planted a keyaki ケヤキ zelkova tree, but whoever would use its branches for firewood was cursed.
. . . CLICK here for more Photos - 臥牛城 !
. a red bull and the okeya 桶屋 bucket maker . The master of the pond Akazu no Ike 明かずの池 was a huge serpent (or a red bull), which killed the villagers and brought much misfortune to the village. So the priest from temple 正元寺 performed special rituals and prayers for seven days and seven nights. The red bull had to flee from the pond and escaped to another one, the pond in Jigokudani (Valley of Hell 地獄谷).
. akaushi ni notta sennin 赤牛に乗った仙人 the Immortal who rode on a red bull . CLICK for more akabeko photos ! Before the development of the town, most of the plain was a huge pond, and its master was a red cow. It killed the priests of temple 福泉寺 Fukusen-Ji one after another. Eventually a samurai turned priest named 和泉良孝 Izumi Yoshitaka began to read the sutras and finally all became quiet in the region. there lived a red cow in the pond, and sometimes it came out of the water, attacked the boats or shapeshifted into a beautiful farm girl and teased the farmers. It also shapeshifted into a dragon and attacked the fisherman and anglers on the shore and the villagers were really in trouble. 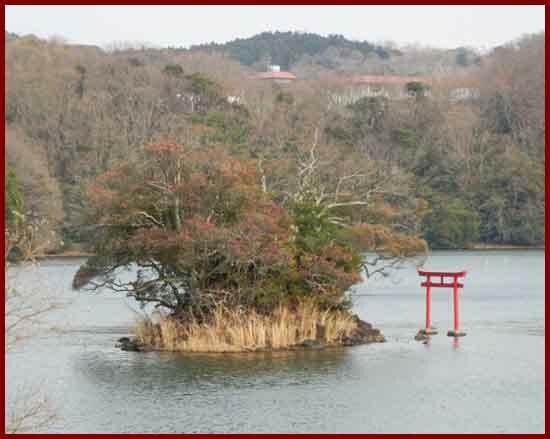 In the Kanei period (around 1635) the priest of the temple 光栄寺 Koei-Ji heared about this nuisance, came to the lake, settled down on one of the small islands and begun to pray and perform rituals for seven days. Finally the red cow was contained and the lake became quiet again. By the way, there is also a small hall for the 水神 God of Water on the island and people come here to pray for rain. Ippeki pond is a small crater lake, about six kilometers south of Ito city. 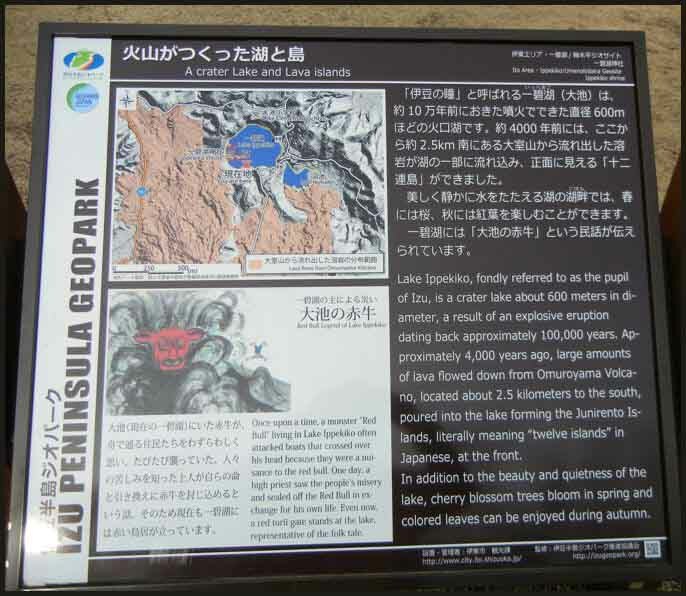 The circumference is only 4 km, but this is the largest lake in Izu Peninsula where there are very few lakes and ponds. There are twelve islands, and the beautiful scene reflecting the Amagi Mountains on the lake is known as the ”the eye of Izu”. The master of the waterfall 万城の滝 Manjo no Taki was either 大蛇 a huge serpent or a red cow. The real master of the waterfall 万城 の滝 Manjo no Taki near the 地蔵堂 Jizo Hall was a red cow. 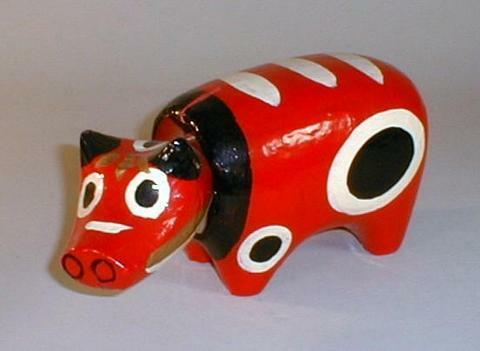 The real master of the Sanagi pond at mount Sanagiyama is a red cow. 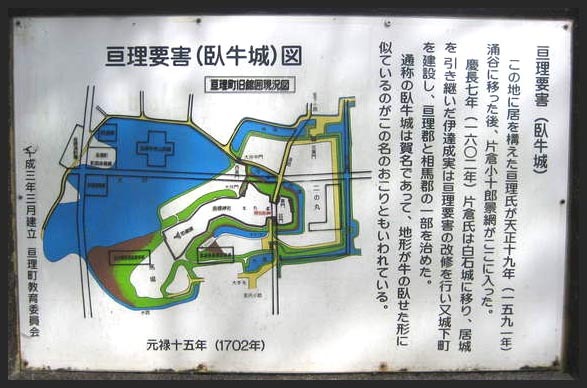 At the pond called Kobuchi there was a thriving forest and also a small sanctuary. In former times when there were visitors, farmers would to this sanctuary the night before and ask for food ready to be served on trays 膳椀, just then number of visitors. The next morning they could get the trays full of food, but they had to bring the plates and trays back by evening. Then one farmer forgot to bring the plates and trays back and the master of the pond, a red bull, got angry and flew away, all the way to lake Suwako 諏訪湖. There was no more food delivery at this pond, of course. (There are similar legends of this type where a Kappa makes the delivery.
. Kappa providing food 膳椀と河童 . Once the son of a millionaire died, so they wrote the name on his back and held a funeral for him. Soon after that in the neighbour's farm a red ox was born with the name of this son written on his back. So the rich man asked to have the ox, but since he was on very bad terms with his neighbour, he did not get his wish. Until they died, they were enemies. that it is no good to write the name or seal on the back of a dead person.